Today we were pleased to welcome the first kids of the 2018 season (they couldn’t wait for the New Year!) with a pretty brutal cold front rolling in, so it seemed like a great time to share the story of having babies right in a bedroom of our home. 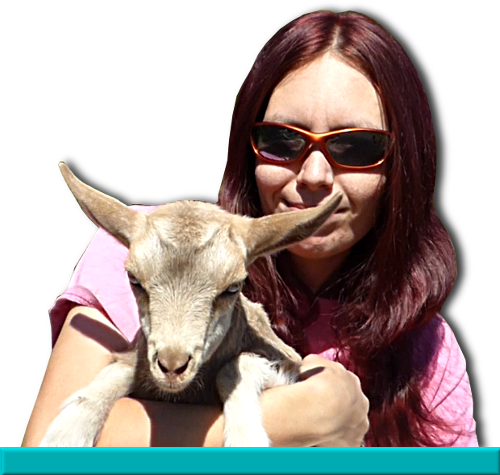 Early in our goat days, we had just moved to a little farm in an obscure town in Texas. Our home was a “fixer upper” with its share of problems, and we were pretty unprepared when we had a nasty cold snap roll in. At the time, I’d severely cut our herd down, leaving us with just two does – Hope and a sweet little doe named Rudy. Hope was due to kid any day, and our temporary goat shelter was far from adequate for newborn kids. I was fraught with worry – we had to find a solution, and quickly. The next morning ice was hanging from our kitchen faucet and the two does were huddled in their little doghouse, so I made a decision. The back room in our home was only used for storage, so I sent my husband to town to pick up tarps and shavings. I moved out the dusty boxes, and we spread the tarps out on the floor and then covered them with shavings. Hope and Rudy came inside without hesitation and we walked them to the back room and gave them hay and water. They seemed to like their new digs, peering out the window with interest and making little nests in the shavings. I for one was delighted with how easy it was to check on them, and half of me wished I could turn the room into a permanent goat stall – but we all know that keeping goats inside long term is a bad idea! Hope, a very smart doe, apparently enjoyed it too and decided to hold onto her babies a little longer. She and Rudy sat in the back bedroom in comfort as our pipes all froze in the wretched cold, then cracked and burst. They gleefully drank expensive bottled water from their bucket as we wriggled underneath the house, pulling out old brittle pipes and replacing it with new. When the sun returned and began to thaw out our frozen little farm, Hope finally went into labor. Her two little boys came quickly and without issue – Hope was always a very good birther and mother. Cute as buttons, they looked exactly like her first set of kids with me, and it wasn’t long before they were up and bouncing around in the shavings. A few days later, all the pipes were replaced and delivering water once more, and Hope’s babies were strong enough to go outside for the first time. Hope and Rudy reluctantly left the back room, clip-clopping down the hallway and out the back door, the two bucklings dancing along behind them making little squeaks of happiness. Those two little boys were like a bright ray of sunshine on our farm, and when they were old enough, they went to an amazing home as pets, and I was able to keep up with them and their adventures for many years – at one point they even came back and stayed for a time while their owner was on vacation. Hope was an amazing goat and she lives on in my memories of little adventures like this. She taught me so much, and her granddaughter Minx has so much of her personality. I still miss her, but her bloodline will live on as long as I can keep it going – let’s “hope” Minx gives us the next generation this year. Happy New Year my friends – I hope you’re looking forward to all the new adventures that 2018 will bring as much as I am. Most of you know Pinky, but if not, let me introduce you! Pinky is the last of the toxoplasmosis infected babies. She had a very rough start to life, developing a terrible infection in her eyes and possibly brain as a newborn, needing round the clock care. She not only survived, but is thriving now! Unfortunately, the viral illness did take most if not all of her sight, but Pinky has never let that stop her. The bigger she gets, the naughtier she gets I think sometimes! Having lived much of her early life inside the house, she is quite certain that the world was made just for her. As Pinky got older, we started letting her go outside to browse under supervision. She became harness trained in no time, and even visited Tractor Supply to pick out a brand new harness! Everyone fell in love with Pinky hard, and we all are dedicated to her lifelong care, even if keeping track of a blind goat can sometimes be a challenge! Pinky’s adventure started out innocently enough. She was in the front yard, picking at grass happily like always. As we all know so well, it’s so terribly easy to become distracted and complacent! Pinky has always stuck very close to the house where she is familiar with her surroundings, but one evening, as we became busy with chores and milking, Pinky decided that wandering off into the big pastures and forest just seemed like a great idea! By the time we noticed, darkness was closing in, and Pinky didn’t respond to our calls. Normally when she becomes lost and confused, she begins to circle and call, helping us to pinpoint her location. We walked out, calling for her, but silence only answered between the crickets chirping in the long grass. Sick with anxiety, we were forced to call off the search before long and returned home, with plans to go back out as soon as there was light enough to see again. Morning milking was rushed through and as soon as it was finished, we trotted out to look for our little adventurer once more. We had around 25 acres of mixed pasture and forest that she could be on now – I tried not to worry too much about predators; thanks to the Z-Team, most wild hunters give our property a wide berth now. We followed the main goat paths, calling for little Pinky, but as the minutes grew longer with no response, our concern only grew. It would break the entire farm’s heart to lose Pinky. After some time I stopped and stood for a while just to think. I knew I could go back and fetch Apple the pony and cover more ground, and decided if we didn’t find Pinky soon, that is what I would do. I took a moment to think more like a goat – where would I be if I was a goat? A blind lost goat? I would go to water, which animals can locate by smell. But Pinky was no where near the main ponds in the pasture, where she had often grazed before under supervision. I retraced paths I know the goats take well, considering the options. Luckily, I spend a great deal of time out with the goat herd and know the property fairly well. I knew there was another pond in a forested area, just an oversized puddle really, shadowed by trees and sheltered in a hollow with fairly steep sides all around. I split off from the others to check that area, calling for Pinky as I went. She didn’t answer, but I spotted her bright little face peering upwards at me as soon as I reached the edge of the trees. “Pinky!” I shouted, leaping down to the water’s edge to scoop her up (Oof, she’d gotten heavy by that point) and bring her back to the pasture. “I found her!” I called out in relief as Pinky nosed at my cheek, as if to ask what took so long. She was no worse for wear despite her long night all alone in the forest. I put her down once we joined up with the others and we patted and made a fuss over her, scolding the little goat for making us all worry and search. She was thrilled with the attention and began to beg for treats, searching eagerly for our pockets. Relieved, we were able to laugh now and we took Pinky home to be spoiled a little extra. Needless to say, Pinky no longer browses without the GPS tag attached to her harness, though her browsing hours are few these days. Now she spends most of her time with the kids, relearning what it’s like to be a goat, and she loves it. It’s amazing to see her boss around the others, and even more astounding to see the other kids adjust their own behavior to suit Pinky’s disability. No matter what happens, Pinky will be cared for and loved for her entire life, and I can’t help but wonder as I bend over to pet her and she looks up at me with her smug little expression, if she’s thinking about the time she had an exciting overnight adventure all on her own.